Takata air bags contain defective propellant devices and inflators that aren’t employing properly when there is a crash. Instead, the air bag’s steel canister fractures and then explodes. This sends plastic and metal parts in the direction of the driver and passengers, and it has resulted in several very serious injuries and fatalities. Because the danger is higher in locations that experience high levels of humidity, residents of Florida, Puerto Rico, Hawaii, the Virgin Islands and the South Pacific are particularly vulnerable. These were the first locations to be warned about the need for repairs, but NHTSA officials requested that the warning apply to every American car to ensure that there is no further risk to anyone. Executives with the former Chrysler, Honda and Toyota voluntarily expanded their repair efforts to include all 50 states. Car manufacturers are suffering from a shortage of replacement parts, and this is contributing to the reason that more vehicles have not been serviced. Takata executives are increasing production of these necessary parts, but they stated that it would take at least two years to complete all of the repairs. NHTSA officials vowed to do what they can to help manufacturers obtain parts so that they can complete these repairs as soon as possible. Toyota executives also listed specific models that contain these faulty air bags, and they are the 2001 to 2004 Lexus SC, Tundra, Sequoia, Matrix and Corolla. NHTSA officials took action in November because they are aware that people tend to forget about warnings to have their vehicles repaired after a little time goes by. Also exacerbating this problem is the fact that these vehicles are older and may not be under warranty. Because of this, the manufacturer cannot remind these owners that there is a recommendation to have the air bags repaired in place. NHTSA officials could not allow this situation to continue because these air bags are so dangerous that they are injuring people who are not even in a vehicle when a collision occurs. For example, several workers at salvage yards in Japan sustained injuries when air bags exploded in these locations. The third air bag-related fatality to be reported in the United States occurred in Los Angeles in September of 2013, and it involved a 2002 Honda Acura TL. The driver passed away in a collision in a bank’s parking lot although his seat belt was fastened. The coroner determined that the fatality was due to facial trauma caused by objects that came from the air bag. A Houston resident lost his life on January 18, 2015 because of the faulty air bag in his 2002 Honda Accord. Although the NHTSA currently lists five air bag-related deaths, others believe that there may be more. It is also difficult to estimate how many injuries resulted from these faulty apparatuses, but some people claim that there have been at least 160 injuries. If you sustained injury in a vehicle that contains the air bags in question and sustained injury or death from its deployment, you should contact an injury attorney. 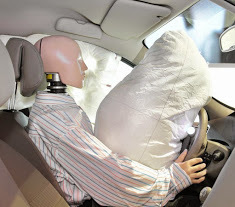 You may have lost a loved one in a crash that he or she would have survived if the vehicle did not have faulty air bags. You may be entitled to initiate a wrongful death lawsuit on behalf of your loved one. It is within your rights to file a claim against the Takata Corporation for monetary compensation because the executives knew about the defect in their air bags in 2004 and did nothing to address the issue. Your personal injury attorney will hold them accountable for this inaction.